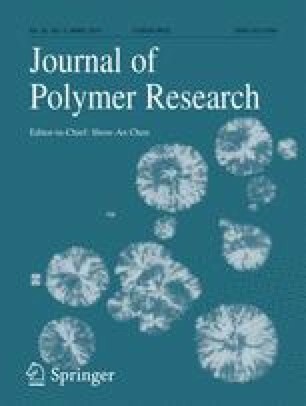 Random copolymers of diallyldimethylammonium chloride (DADMAC) and carboxybetaine 2-(diallyl(methyl)ammonio) acetate (DAMA) with different compositions (10%/90%), (50%/50%) and (70%/30%), as well as poly(DAMA) and poly(DADMAC) homopolymers, were synthesized. Molecular characteristics of poly(DADMAC–co–DAMA) copolymers and homopolymers were determined in water solutions in the presence of 0.1 M NaOH and a low molecular weight salt (NaCl in various concentrations) by viscometery, dynamic and static light scattering. Dependences of several important conformational parameters, such as swelling coefficient α, the Huggins constant kH, and the second virial coefficient A2, on copolymer composition (charge asymmetry) and NaCl concentration in solution were analyzed. It was shown that growth of charge asymmetry leads to sharp increase in copolymer size. The reported study was funded by Russian Foundation for Basic Research (RFBR), according to the research project No. 16-33-60104 mol_a_dk. Authors are grateful to the Center for Diagnostics of Functional Materials for Medicine, Pharmacology, and Nanoelectronics (St Petersburg State University).